Thomas Boyd, The OregonianSome shelves that normally hold ammunition are bare at the Fishermen's Marine & Outdoor store in Oregon City. Retailers say that a spike in gun sales after the election of President Barack Obama has slackened but that ammunition sales are still through the roof. "Shoot straight," he called to the man, leaving with his new Springfield Armory XD pistol. "Don't waste ammunition. It's hard to get." It might seem like strange advice from someone who makes a living selling firearms and ammunition in La Grande, a northeast Oregon town where pickups commonly sport a rifle or shotgun in the rear window. But fear of restrictions on guns and bullets -- swept in with the election of Barack Obama -- has triggered a buying frenzy not only in the rural towns of eastern Oregon but also across the state and the nation. 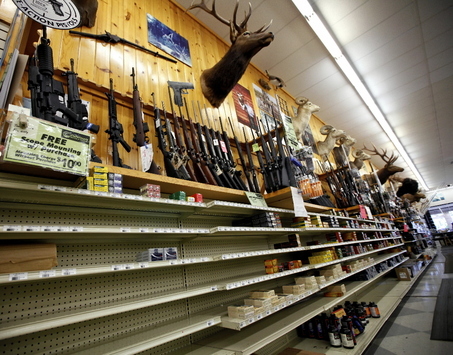 Gun purchases have leveled off, dealers say, but ammunition sales show no sign of letting up. That has led to hoarding, empty store shelves, huge back orders and renewed interest in home-loaded ammunition. "This has gone completely beyond goofy," said Henderson, 65, who has no bullets for many of the 200 handguns in his Oregon Trail Trader store and who rations the ammo he does have. "I thought after Christmas it would ease up." Manufacturers can't produce ammunition fast enough to meet the demand, said Chris McBride, spokesman for All Sports Supply Inc., a Clackamas shooting and recreational equipment distributor. If they could "ship, right now, all the ammunition that's on order, it would probably be three or four times more than they've ever sold before," he said. At the Front Sight Firearms Training Institute, a tactical shooting school in Las Vegas, an employee works full time to find and buy ammunition so students -- who typically send 800 bullets flying downrange during a four-day handgun course -- have enough. "What I see is the price has doubled and tripled and people are buying it like crazy," school spokesman John Landwer said. Front Sight attracts 12,000 students a year from around the U.S. to learn the finer points of fighting with handguns, shotguns, rifles and even submachine guns, he said, and nearly all complain of ammunition shortages back home. Dealers say a carton of .22-caliber ammunition that retailed for $10 last year can bring $40 today. Twenty-round boxes of .223-caliber ammunition that brought $6 last fall now retail for $14. Most dealers have run out of 9 mm, .22-caliber, .38-caliber, .380-caliber, .45-ACP and .45-caliber Colt handgun rounds. Scott Thatcher, owner of Thatcher's Ace Hardware in Baker City, attributes the buying to anxiety about the future among people who see firearms and hunting as a way of life. "Is ammunition going to be so high-priced we can't even afford it?" he asked. "They don't know what's going to happen." Aggravating the situation, speculators are stocking up in hopes of profiting if prices go higher, Thatcher said. He had 40,000 rounds of .223-caliber ammunition -- often used in AR-15-style "assault" rifles -- in stock recently, when a Boise resident came into his store and offered to buy it all. Thatcher refused, and his regular customers emptied the shelves instead. Jim King of Baker City, a Vietnam veteran and former Los Angeles police officer, said the purchases are a grass-roots reaction to a belief that Obama opposes firearms and an endorsement of the Second Amendment's "right to bear arms" clause. "Number Two protects all the others," said King, 65. "I think people are making a statement: 'Don't mess with our Constitution.' I believe the people in this country are saying, 'Wait a minute, it isn't about you running all the people. It's our country; it's not one man.'" Greg Monahan, a history professor at Eastern Oregon University in La Grande, termed it "weird and bizarre" that the nation's new president would provoke so much suspicion. "Here is this guy who is maybe the most popular president we've had in years," said Monahan, 55. "For a certain sector of the population, he must inspire a lot of fear." Monahan said the president and Congress appear to have little interest in legislating against firearms. The Democratic-controlled Congress, for example, recently restored a Bush administration policy to allow concealed guns in national parks. Gun and bullet sales took off right after the presidential election, Henderson said. November-to-January gun purchases at Oregon Trail Trader were triple anything he had seen before. Rick Hadden, owner of Garner's Sporting Goods in Pendleton, even posted a photograph of Obama with a tongue-in-cheek caption: "Firearms Salesman of the Year." But while gun sales remain brisk, "the panic is not on guns right now," Henderson said. The scarcity of bullets has generated enthusiasm for homemade ammunition, dealers say. Some reloaders are making bullets for friends and relatives, and that, in turn, is causing shortages of reloading components such as gunpowder and primers, which ignite gunpowder in rifle and pistol cartridges. Wes Johnson, 70, of La Grande said he searched for a month before finding and buying 1,000 primers to reload ammunition for his .25-06-caliber deer rifle. Richard Cockle, The OregonianLes Henderson, owner of the Oregon Trail Trader store in La Grande, talks with retired logger Wes Johnson of La Grande about the difficulty of getting ammunition and components needed to reload ammunition. "I probably won't use 'em up in a lifetime," said Johnson, a retired logger. "Now I'm looking for some small pistol primers for my .357 Magnum. I've even got my buddy in Idaho looking for some." The situation makes dealers nervous, said McBride, the All Sports Supply spokesman. Many have huge orders outstanding and worry that if ammunition suddenly becomes available, prices will nosedive and they'll be overstocked. It all amuses Bob Cooper, a 75-year-old former Oregon State Police trooper who lives in La Grande. "This is all foolish," said Cooper, an avid hunter, recreational shooter and reloader who thinks federal officials are too busy with the economic slump and foreign policy to tangle with the powerful gun lobby. "They can crash and burn on that rock." Although some think firearms squabbles break along liberal-conservative lines, Cooper said it's not that simple. "I've found quite a few liberals that are pro-gun," he said. "In fact, I married one of them."